39000, 39002, 39004 – Chroma Filter Model No. 기본 형광 필터 세트의 세부정보는 제품의 모델명을 클릭하시면 확인하실수 있습니다. JNO-U(B) filter set induces the light of the UV wavelength range to the sample and leads the generated fluorescence to the observation system. JNO-U(L) filter set induces the light of the UV wavelength range to the sample and leads the generated fluorescence to the observation system. JNO-B(B) filter set induces the light of the Blue wavelength range to the sample and leads the generated fluorescence to the observation system. JNO-B(L) filter set induces the light of the Blue wavelength range to the sample and leads the generated fluorescence to the observation system. JNO-G(B) filter set iduces the light of the Green wavelength range to the sample and leads the generated fluorescence to the observation system. JNO-G(L) filter set iduces the light of the Green wavelength range to the sample and leads the generated fluorescence to the observation system. 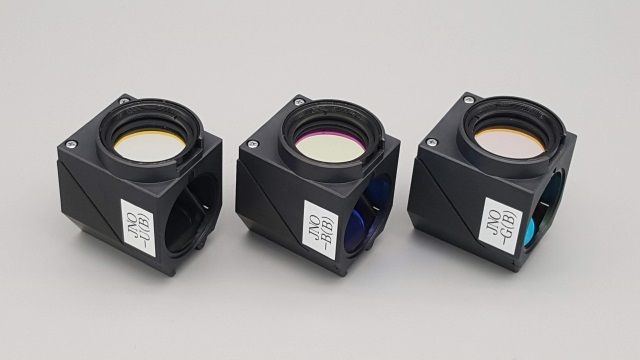 JNO-R1(B) filter set induces the light of the certain wavelength range to the sample and leads the generated fluorescence to the observation system. JNO-R2(B) filter set induces the light of the certain wavelength range to the sample and leads the generated fluorescence to the observation system.